The parties that really are memorable to me, no matter how big or small, have four parts. The food, the drinks, the details, and the music. It certainly can seem daunting if you've never hosted a party or a dinner for a group before, but if you keep these four things in mind, you have a great start. Today I am going to start with what is sometimes the easiest of the four, The Bar. 2 types of red wine; For my husband and myself, this is Pinot Noir and Cabernet Sauvignon. You could also have a Petite Syrah, a french bordeaux, or one of my husband's lighter favorites, a Pinot Nero, in place of the Pinot Noir. A good substitute for the Cabernet Sauvignon would be a Shiraz or a Malbec. In a nutshell, have something that pleases the light versus full bodied crowd. Not sure about wine? Find me on social media, I am thrilled to help! Are you at the liquor store RIGHT NOW? Then ask your local wine store employee or owner. They will have great recommendations within budget! But how much do I buy? Of course, this is a guideline! Know your audience. You have a bunch of wine drinkers? Get some extra. Money saving tip: I know, I know. You want to impress people. But, listen to me. PLEASE…..If you want to impress and serve a pricier wine….follow the 3 bottle rule. You do not – I repeat YOU DO NOT- need to serve the best stuff all night (unless of course you're making it rain, and then by all means, go for it). This means, serve the good stuff, then the ok stuff. My husband I laughed about this a while back while having dinner with some friends. After crushing the first two, we all realized at this point, put the Heitz away and bring on that less expensive one. By the time your guest sips a glass from the third bottle, they do not need to be sipping the $50 per bottle any longer. They may not remember, anyways. Also, by this point you may need to order an Uber or call a cab or a friend to grab them to get them home if they drove. Always have a designated driver, or a sleep over. · IPA. It’s my husbands favorite (not mine). You'll have a friend who enjoys that bittery and hoppy goodness so cover your base by making sure you have some of these. · A good old Pale Ale or Lager. I’m saying the likes of Sam Adams, Fat Tire, or Cisco's Whales Tale. · A dark beer. Stout or a Porter. Especially in the winter time! I particularly enjoy the bourbon aged stouts. So to recap, serve a light, a medium, a dark. There is a lot of wiggle room in what you serve at a party. Of course, you can keep it simple and just have wine and beer. Or just wine. Or just beer. Especially if you're hosting a wine and cheese cocktail party or a beer tasting party with various meats and pretzels. If you choose to have a full bar at your event, consider this; always have a brown liquor (scotch or whiskey), a clear liquor (vodka is always safe, if you want two, have gin also), and a wild card, perhaps tequila. Think about when you go to a restaurant or a bar. Do they serve your cocktail without a garnish? 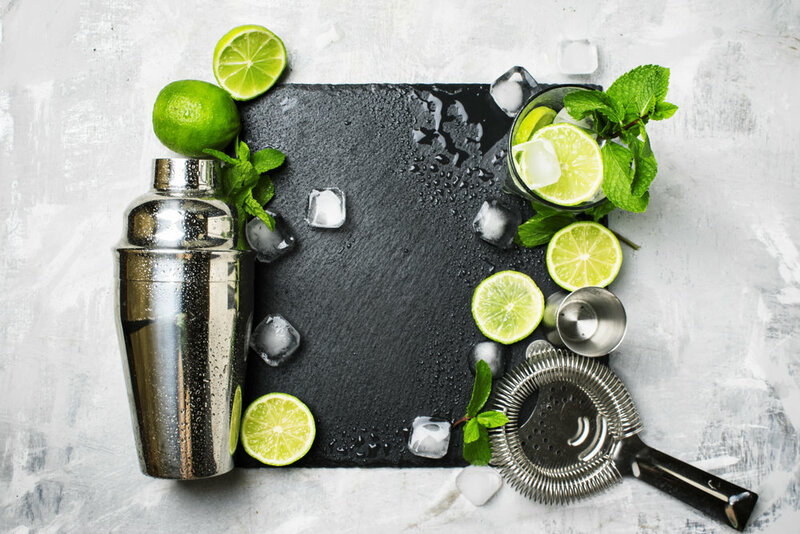 It can be a lavish garnish or a small one, but people can be specific about their cocktails and may want that cherry and orange flag on their Amaretto Sour or just a squeeze of lime in their vodka soda. Candied ginger, orange, lemon, pinapple, etc. This is super fun but totally not a basic bar set up. If you have a cocktail with ginger in it, I highly recommend getting some candied ginger for your garnish. Delish. Glass Marker (to write names on the glasses) and/or wine charms. Ok, so you're nearly there! Set up your table(s). You may find having a table with glasses and another with bottles works for you, or maybe not. Look at the size of your party and how many glasses you need. Having 50 people? More than one table makes sense. Having a group of 20? One may do. Maybe you have a long bar in your home, but if you don't play around with set up and make sure the flow makes sense. Open up one bottle of each type of wine and have it ready to go. Put out your cocktail and wine glasses (with charms all ready attached) and/or glass markers on a table. Have your beer chilling and mixers out and garnishes accessible. When this is all done, please kick back and pour yourself a drink. Salud!